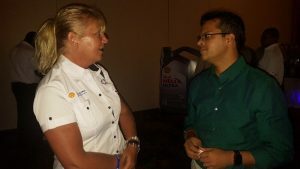 SOL (Guyana) General Manager, Liz Wyatt and Chief Executive Officer of the Guyana Energy Agency Dr. Mahender Sharma chatting at SOL’s launch of the Shell Helix Ultra PurePlus Technology advanced lubricant at the Pegasus Hotel. Guyana is preparing to deploy oil spill equipment as part of preparations should there be breach more than 120 miles offshore where commercial oil production will begin in 2020, Minister of Natural Resources, Raphael Trotman has announced. Addressing a Civil Defence Commission Stakeholder Meeting on the National Oil Spill Contingency Plan, Trotman said four containers of oil spill response equipment and accessories including booms, skimmers, dispersants and other items would be located at strategic points to respond to an oil spill. “These are presently stored at the CDC’s Alternate National Emergency Operations Center (ANEOC) at Timehri and will soon be pre-positioned at various locations to facilitate ease in deployment should the need arise,” he said. Meanwhile, SOL, a leading petroleum company in the Caribbean and Central America, says it is an oil-spill partner with ExxonMobil in Guyana. “We actually do an incident command centre training with them and we have done that here with them four months now so we are actually coordinated with them,” General Manager of SOL (Guyana) Inc; Liz Wyatt told Demerara Waves Online News after her company launched its Shell Helix Ultra PurePlus Technology advanced lubricant which is the first motor oil designed from natural gas. She explained that SOL is Exxon’s oil spill training partner and her company has equipment, as part of “one system” with several partners including the Civil Defence Commission. In the area of oil spill response training, the Minister of Natural Resources has announced that training sessions on Incident Command Systems (ICS) and Fundamentals of Oil Spill Management for stakeholder representatives would be held from April 23-28, 2018 at the Civil Defence Commission’s emergency operations centre at Timehri and Splashmin’s Resort. The Natural Resources Minister said the Commission is collaborating with the Guyana Energy Agency, Maritime Administration Department, Environmental Protection Agency, Guyana Geology and Mines Commission and the Guyana Defence Force in developing a “robust” oil spill response plan. He added that the plan would be reviewed by Cabinet after consultations are completed. “I charge you to see your work here as important and craft a National Oil Spill Contingency Plan that can efficiently and effectively keep our offshore waters free of pollution and our beautiful coastlines pristine for the enjoyment of future generations,” he said. ExxonMobil, based on discoveries offshore Guyana to date, intends to produce 500,000 barrels per day from its wells here.